The Black-cheeked Lovebirds (Agapornis nigrigenis) are considered the most endangered of all the African parrot species with the smallest area of distribution within its genre. They belong to a group of lovebirds commonly referred to as the "eye-rings" - which also includes the masked, fischer and nyasa lovebirds ... (The term eye-ring refers to the featherless white rings around their eyes.) Previously thought to be a sub-species of the Nyasa or Lilian's Lovebird, Black-cheeks are nowadays considered a separate and distinct species. 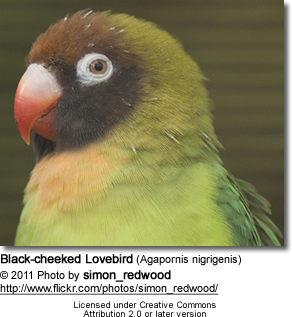 The Black-cheeked Love Bird was similarly not described until the early 1900's and was imported shortly thereafter. Black-cheeked Lovebirds are endemic to South-western Zambia between the Kafue river to the north and the Zambezi river to the south. Sightings have also been recorded in Botswana, and they could possibly be breeding in Northern Zimbabwe, although some authorities consider them extinct in the latter area. These lovebirds mostly occupy Mopane woodland, but are also found in also Acacia woodland and agricultural areas, where permanent supplies of surface water exist, as they need daily access to water. In the dry season, they may congregate in large flocks of up to 800 or more. This species is fairly common within parts of their small range, but they are vulnerable as its small population is undergoing a continuing decline likely caused by gradual decrease or disappearance of water bodies within its highly localized range. 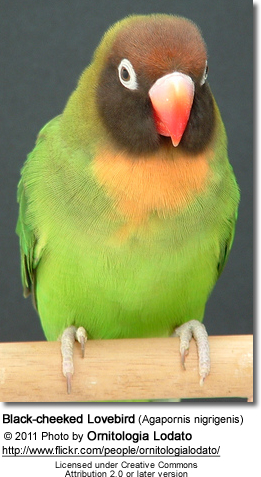 The Black-cheeked Lovebird is slightly smaller than the Fischers or Masked members of the "Eye ring" or "personata" group. (Eye-rings are named for the white featherless rings around the eyes). The adult averages 13 - 14 cm (5 - 5.5 inches) in length (including its short tail) and weighs between 40 and 45 grams (~1.4 oz). It has a mostly green plumage, black face, reddish-brown forehead and forecrown, brownish-black cheeks and throat, orange patch below the throat which fades to yellowish-green, and grey feet. Adults have bright red beaks, while juveniles of the species are similar but with a more orange bill. Juveniles are dull in color until after the first molt. Young birds have black markings at the base of the bill. Mutations: Black-Cheeked have no confirmed (true) mutations. 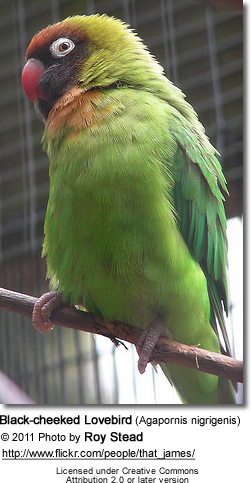 The mutations that are generally available in the market are hybrids of Black-Cheeked and Masked Lovebirds. This being said, a striking blue mutation has been reported - but its purity is yet to be confirmed. The Black-cheeked Lovebird feeds mainly at ground-level on annual grass seeds, but also on other vegetable matter and insect larvae, and on corn, sorghum and millet. Captive lovebirds should be fed a quality parakeet seed mix, in addition to providing them with vegetables and fruits (apples, berries, etc.). It is recommended to supplement their diet with vitamins and minerals. Bird-specific vitamins are available at the vets or better pet stores. Mineral blocks and cuttlebone should be provided throughout the year. Fresh drinking and bathing water should also always be available to them. Comprehensive information about bird diet and bird nutrition. Vocalizations are loud, piercing shrieks or shrill and high-pitched chattering. However, their calls are not as penetrating as those of other lovebird species. 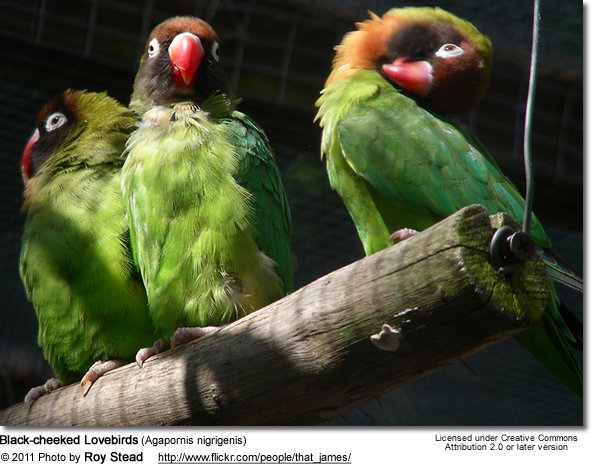 Black-cheeked Lovebirds are relatively easy to breed, but having only been recently established in aviculture, they are not as hardy as other, more established, lovebird species. This is likely caused by extensive inbreeding of existing stock due to their low numbers. This may account for reduced fertility, low hatchability of fertile eggs, poor survival of young and increased susceptibility of disease. They typically start to breed at the age of 10 to 12 months and may continue until they are five to six years. 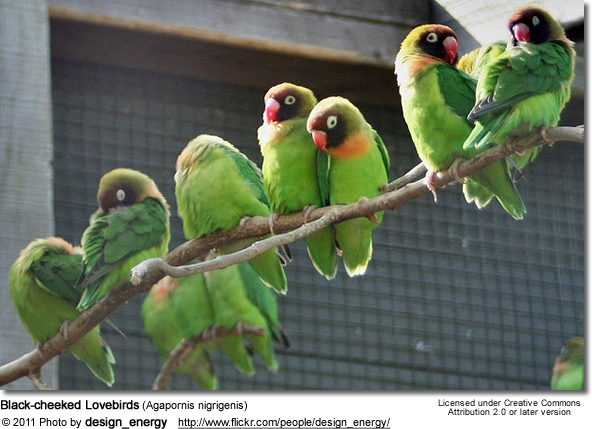 Black-cheeked Lovebirds are docile and peaceful in nature and will breed in a colony setting; however, overcrowding can cause stress. It is also important to keep in mind that during the breeding season the male displays a more aggressive behavior. 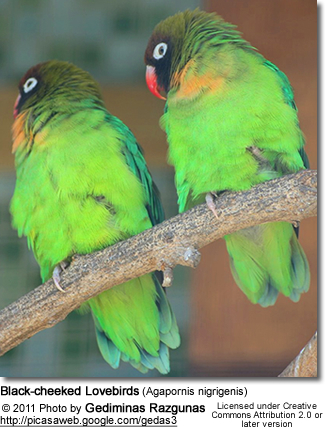 Compatible Black-cheeked Lovebirds can be prolific breeders - potentially producing three clutches in a season. However, they should be allowed to rest in between clutches to prevent clear eggs, dead-in-shell, weak and exhausted parents - and to avoid health problems in the female in particular. The breeding season typically starts in March or April. Before the breeding season commences, the nesting boxes should be inspected and carefully cleaned. There are nesting boxes for lovebird-size birds, but if not available a cockatiel nesting box will do just fine. The old nesting material should be replaced with clean substrate (hay, peat, moss, etc.). The hen is likely to add fine twigs, bark and feathers to line the nest box with. The male may assist with the actual nest building. Once the nest box is prepared to their liking, courtship and copulation takes place. The male's behavior typically involves frequent head scratching followed by head bobbing whilst turning around on the perch in front of his female. The hen crouches down on the perch with both wings extended, inviting the male to mate with her. The pair is seen regurgitating food and feeding each other. Prior to egg laying the female's droppings are larger and more watery in size. She spends more time at the cuttlefish acquiring the calcium she needs for egg production. Once egg laying commences, the hen lays on alternate dates. The average clutch size consists of 3 to 6 eggs and the hen incubates the eggs for about 21 - 23 days. The female only leaves the nest for feeding or to relieve herself. The male enters the box to feed the female. The newly hatched chicks are covered with a pinkish down. Their eyes are closed and remain closed for about 10 days. During this time in particular, the parents are very protective of their nest and get easily upset by nest inspections, which should be kept at a minimum. With young in the nest, rearing food should be provided. Young sweet corn at the milky stage is eagerly accepted. The young will be cared for by the female until they leave the nest at about six weeks of age. The father then takes over the feeding of the young birds for another two weeks or so until they are weaned. It is best to provide weaned youngsters their own nesting boxes. One way to identify compatible pairs is to allow them to bond and pair up naturally. One can find true and compatible pairs sleep together in a nest box before they are old enough to breed. Al the end of the breeding season, the nest boxes should be cleaned, the floor covered with suitable substrate and placed back into the aviary for the birds to use for roosting and keeping warm during the winter period. Close-ringing should be done when the chicks are 12 to 14 days old. The chicks will leave the nest box when they are about 42 days old - at which time, they will be fully feathered and able to fly. Once the female is laying eggs again, it is best to remove the weaned young. The perches in the flight should be natural branches of varied sizes, which is essential for healthy feet. Comprehensive resource on breeding lovebirds. Since this lovebird is so endangered, experts would like to see any captive black-cheeked lovebirds be placed into a well-managed breeding program to ensure species survival. However, if there is an individual that isn't able to breed and you are considering it as a pet, the following may be of interest. Lovebirds are pretty easy to manage for most people. They are not as destructive and noisy as their larger cousins. If not properly socialized, however, they will discover their beaks as method of "disciplining us". Biting: If not properly socialized, however, they will discover their beaks as method of "disciplining us". They can be very aggressive towards other animals (including birds), if they don't know them or are jealous of the attention they are getting from their favorite human. Noise: Lovebirds are very vocal birds, making loud, high-pitched noises that can be a nuisance. They make noise all day, but especially at certain times of day. Chewing: As stated above, lovebirds are also very active, and love to chew things. When they are let out of their cage, it would be wise to watch them carefully, and protect any furniture, electrical wiring or anything else that they could possibly chew on. They are not big chewers - as their preferred medium is "paper." Paper: They love to tear up paper -- especially when they are in the "mating" spirit -- which is all-year-round for birds kept indoors (not exposed to the seasons). I have learned not to keep important papers laying around - and even use it as a way to keep my lovebird busy.